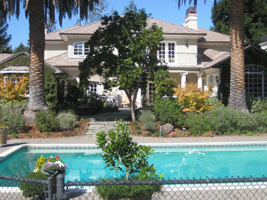 I just came back from previewing a couple of homes for sale in Atherton that will be going on the market next week. Some of them were great deals, as I mentioned on my twitter feed, while others were overpriced in my opinion. I’m not going to mention the overpriced homes on broker tour as I’m not here to give you any false salesmanship, I’ll leave that up to the others. One of the homes I really liked is expensive, but a great value compared to others that are similar or higher priced. This one has a tennis court, pool, pool house and a great design that allows the main rooms in the house to all look out towards the magnificent backyard. It has been remodeled recently and everything from the kitchen to all the bedrooms are like new. My guess is that this home could sell quickly, despite the hefty price of over six million dollars. A great buy for the right buyer. This isn’t on the market yet, but give me a call or schedule an appointment on my website if you want to know more and possibly schedule a tour.